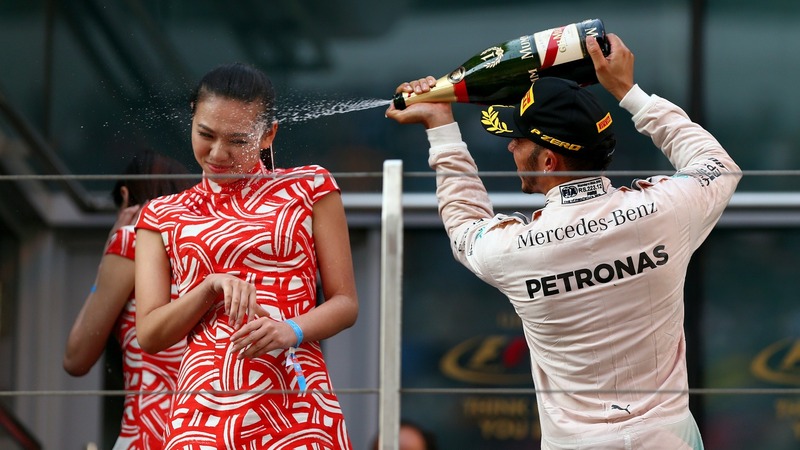 Was Lewis Hamilton sexist to spray champagne in podium model’s face? One title Lewis Hamilton probably doesn’t want is that of a sexist pig but that’s just one of the choice phrases being used to describe him after images of him celebrating his Chinese Grand Prix win on Sunday were published. It turns out spraying a grid girl with champers is something of a ritual for Hamilton, who also did it at the Spanish and Austrian Grand Prix (despite having lost out on the top spot at the latter). In fact so renowned are his champagne popping skills that he was asked to demonstrate them on The Graham Norton Show in 2013. Many social media users have echoed Hardie’s views, calling the Formula One champion “an embarrassment to the U.K.,” an “ignorant clown” and “a scumbag”. Some went as far as to accuse him of bullying and racism. Drivers spraying each other and their crews with champagne after a race has been a Formula One tradition for almost 50 years and a little collateral damage is to be expected by anyone in the vicinity. It’s Hamilton’s targeting of the women — in what is one of the most male-dominated sports — on the podium that has angered so many people. If the grid girl had the option of grabbing a bottle of fizz and returning the favour — right into Hamilton’s face — the balance would be redressed a little. But, of course, she has no option but to stand there and look pretty. What do you think? Is Lewis Hamilton guilty of sexism or are people making too much out of it? Let us know in the comments section below.